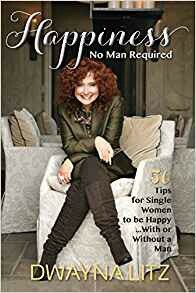 Dwayna Litz’s 50 Tips teaches women how to feel complete and whole with or without a man’s affirmation. Statistics show that many women in the United States are currently staying single not because they do not want to be married but because they cannot find the right man for marriage. Each chapter provides valuable advice and examines each topic through a combination of anecdotal tales of Dwayna’s positive as well as negative relationships. All 50 Tips can be read separately or in sequential order. Each has an easy homework section that enables the quest of finding romance with a man to first discovering how to become at peace within. Litz’s premise is that when any woman learns to like and appreciate who she is and realizes what it means to be true to herself, no man is required for a happy and fulfilling life. Dwayna’s strength comes from her Christian convictions and her tips include references to the Bible. However, this book works for every woman no matter what faith. If you don’t want to accept Dwayna’s faith-based tips, you can still read the book for the excellent research and insights into the differing aspects of love, relationships, love addictions, dating, and romance. One of the strengths of the book is that it is well written, and each tip is a logical progression, that enables the reader to grow almost effortlessly. By the end of the book, Litz has provided a solid map of the pitfalls to avoid, as well as enabling each woman to appreciate and celebrate her own self-worth. Happiness No Man Required helps shift the focus from finding a romance with any man, just because you are in love with romance, and discovering inner peace and happiness. Once this is done, then you’re ready to find a true relationship between equals. There’s never a need for you to accept co-dependency or even an abusive partner, just so you can say you have a man. Happiness also delves into the male side of the love equation. She is not a “man basher” but does include important, serious observations into the psyche of men that women come across while looking for love, and not only shares insight into how to spot the right ones, but the wrong ones as well. There are special tidbits of advice she offers that can warn women when a man isn’t just being abusive, but could be a psychopath too. Some of the chapters reveal the depth and breadth of what Litz is espousing in a woman’s quest to achieve her own happiness first. Know the Difference Between Love and Love Addiction; Give Yourself 90 Days to Detox; Count Your Blessings; Leave Mr. Wrong Without Gaining Weight; Happiness=Compatibility in Character; An Abuser Will Still Be Abusive Even if You are Perfect; Beware of Dangerous Men in Church; Happiness Happens When You Least Expect It and 42 more chapters filled with tips, anecdotes and remedies to turn bad experiences into positive life affirming ones. Although no names are revealed, Dwayna’s experiences with so-called “holier-than-thou Christian men” — both pastors and just those professing their beliefs — are cringe-worthy warnings about wolves in sheep clothing. She shares these stories both as precautions and examples so that readers may benefit from her experiences. She doesn’t use these tales to condemn the past men in her life, although I found some of these anecdotes and memories rage-inducing — especially when I read how she’d been abused by a trusted pastor, and since no “penetration” occurred, it took her years to realize the extent of the harm he’d caused her. I really wanted to smack him. Dwayna used her faith, her own tenacity, and her careful observation to write a book that can benefit all women, and is also a testament to how her own faith helped her transcend the often frightening world of relationships — especially with the wrong man. I recommend this book to any woman seeking a relationship and is caught in the murky dating world that is often confusing and frightening. Using Happiness No Man Required as a guide gives any woman the chance to find her own true self, and then be ready for the right man to complement her, and not overpower her. Dwayna is a singer, songwriter, health coach, public speaker and entrepreneur, and founded the Lighting the Way Foundation, which helps people understand and appreciate the true religion of Christianity. She had her first success with the song “Let Me Be There for You” (co-written with Jayne Olderman) and it was recorded on Patti LaBelle’s Grammy nominated “Flame” CD in 1998. She works in both Nashville and New York City as is a singer, songwriter, author, speaker, health coach and entrepreneur with music available online at iTunes, CD Baby, Walmart, Tower, and Best Buy. You can find Happiness — No Man Required on Amazon and Barnes and Noble, or it can be ordered through bookstores and from Dwayna’s website and be sure to check out her music as well. She has a lot to share with the world. Diary of Single Women! Thank You — Not! You Judgmental Bunch !